"I spoke to Ms Wang Cuihua, a frontline worker at the GEM factory. She dismantles about 400 televisions manually every day. She told me that before, she would get covered in phosphorous dust every time she opened a television, even though she was wearing a protective masks and goggles. With the introduction of the new dust-extracting devices, most of the dust is now vacuumed away, and she is happy that she works in a much cleaner and safer environment." “I have a degree in Applied Chemistry, but I did not know much about Persistent Organic Pollutants (POPs) and their damaging nature until I started working on pesticide management in 2007 in Hubei Province. Through my job I learnt that improper dismantling and processing of e-waste releases organic pollutants that have a detrimental impact on human health and the environment. 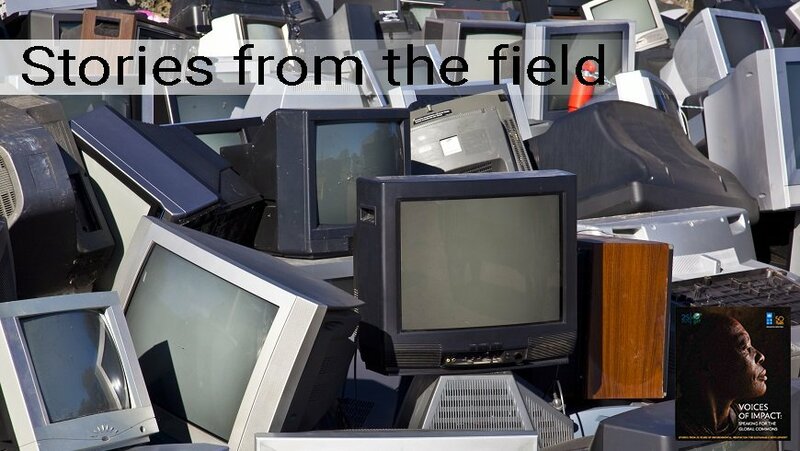 To give you an idea of the scale of the issue – it has been estimated that in 2015 alone, the number of e-waste items recycled in China amounted to 152.74 million pieces! So this is a challenging task for those of us who work on waste management, but, I think that we are now on the right track. This is where the e-waste project has come into play. With the right technical back-up, and new technologies and equipment, we have been able to ‘close the gaps’ and implement the Extended Producer Responsibility and e-waste management systems – at least at pilot sites. Working with three companies in Hubei province, including the Green Eco-Manufacturing Co. Ltd (GEM), we are piloting environmentally friendly waste management and processing practices. We have upgraded production lines, introducing control techniques that prevent harmful chemicals from being released during the e-waste dismantling process – this is important for both the health of factory workers and the environment. We have also been able to improve our e-waste Management Information System at pilot companies with new technology involving video-monitoring devices and a standardized barcode system. I must tell you that introducing this has not all gone smoothly! Initially the companies thought that the new system would mean extra labour and procedures for them. Now that the system has been in operation for a while, they have seen the benefits themselves. We at the provincial department are able to collect accurate data on processed e-wastes, and the workload of the companies has been reduced – a win-win solution! What also inspires me is that other e-waste processing companies, having seen the benefits at the pilot companies, are now upgrading their own production methods and changing how they operate. We are now seeing exciting innovations in the e-waste processing sector - mobile app-based solutions like Huishouge (Recycling Brother) and Baidu Recycle have meant that consumers can now access certified e-waste recycling and dismantling companies and dispose of their e-waste in an environmentally responsible way. MR YANG LIQUN is an Engineer at the Hubei Provincial Solid Waste and Chemical Management and Pollution Prevention and Treatment Center, which is a branch of the Hubei Provincial Environment Protection Bureau. He holds a degree in applied chemistry and has been working in his current capacity since 2007. He manages a programme of work related to e-waste management and pollution reduction in China, as well as related international projects.